Easy on the eyes and wallet, but can Asus's premier smartwatch cut it? If you're after a stylish smartwatch that does your basic range of Android Wear things, the ZenWatch is worth a look. Beyond that, there's little difference from the other similarly priced Android Wear watches. Update: Along with most of the others, Asus' original ZenWatch has been updated to Android Wear 6.0, bringing along new gesture controls and other features. And it's made our list of best Android Wear watches, to boot. But shouldn't you be more interested in the newer Asus ZenWatch 2? Among some huge improvements, including different sizes, faster charging time and new crown, it's not a whole lot more expensive than the original. Even so, the original ZenWatch remains a smart buy if you're looking to get into the world of Android Wear for as little money as possible. However, once Android Wear 2.0 comes along, don't expect this watch to receive support. More and more smartwatches are cropping up every month, making it harder for new ones to stand out from the increasingly crowded space. 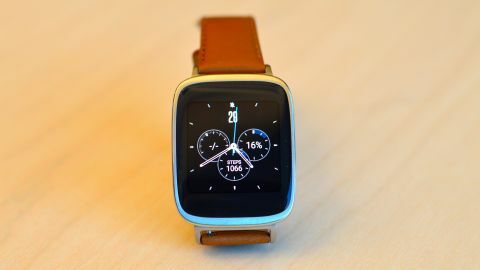 The Asus ZenWatch was a surprise when it was first announced, considering Asus wasn't a company expected to enter the wearables world. But it was promising from start. The first teased images of the ZenWatch were enough to intrigue the wariest wearable-fatigued fan (me), because of its surprisingly attractive design. Once released, the price of $199 (£199, about AU$252) added to the appeal, though it hasn't caused a huge stir in the wearables world, primarily because it lacks a wow-factor that would make it memorable. It's also only compatible with smartphones running Android 4.3 and up, which means iPhone users are out of luck. A sharp-edged, rectangular screen within a round-edged rectangular face is not going to win any plaudits from the high-end design community, but it's functional. The problem is more that, at 1.63 inches and 320 x 320 (278 ppi), the Corning Gorilla Glass 3 OLED screen can appear rather pixelated, if you look at it for more than a glance. It's still a slightly higher density than the LG G Watch R and the Sony Smartwatch 3, and even the Moto 360. The tiny panel is reasonably bright, but again, I've seen better in this department too. That said, it's perfectly serviceable, and it would be a stretch to say the screen is out-and-out bad. There's sadly no ambient light sensor so you're stuck with manually turning up or down the brightness in the settings.